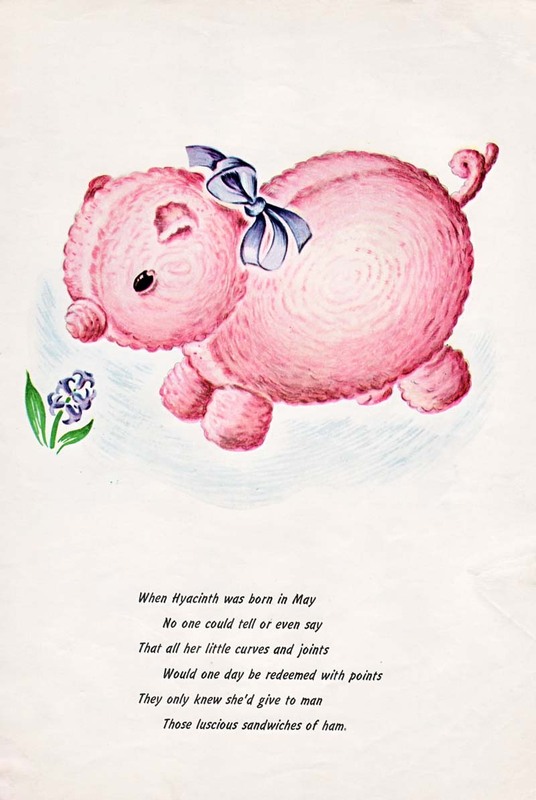 This cute pig pattern is from a 1943 booklet from the Spool Cotton Company entitled Crochet Your Victory Barnyard. 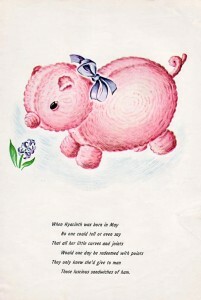 There are also patterns for a girl and boy in addition to all the other barnyard animals. Since polyfill wasn’t around in the 1940s the the patterns call for cotton batting and all are crocheted with Knit Cro Sheen. This should produce a stitch that is small and not quite as conspicuous as worsted. This free pattern is available for download by clicking here. You also might like reading the little poem with each animal. Clicking on the image will bring up the full size so it can be easily read. Don’t strain your eyes!